The Zen of Slow Cooking's Indian Dal blend is derived from one of their most popular blog recipes for curried lentils. Indian Dal is a cornucopia of healing potential, with impressive pharmacological properties. The Golden Spice Turmeric not only flavors and colors but has legitimately shown in clinical trials to help protect our maturing brains from age related neurodegenerative conditions via its powerful Curcumin component. 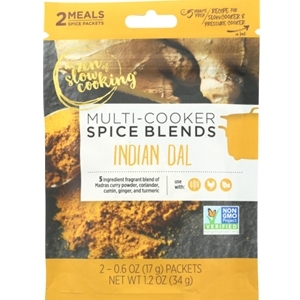 Contains two meal seasoning packets. Heat oil in a skillet on medium; sauté onion & garlic for 2 minutes. Transfer onion mixture to slow cooker sprinkle the Indian Dal blend; add the salt, pepper, tomato paste, red lentils, broth & coconut milk. Stir, cover and cook on LOW: 6 hours or HIGH: 2 1/2 - 3 hours. Spoon the dal over brown basmati rice or serve as a curry side dish with naan bread. Heat oil in Instant Pot on medium sauté function cook onion & garlic for 2 minutes. Stir in Indian Dal blend, salt, pepper, tomato paste, red lentils, broth & coconut milk. Serve with your favorite Indian chutney and crunchy papadums.